I’d like to share something little more somber than my usual. Today is Good Friday…the day we commemorate the death of Jesus on the cross. I have a few thoughts to share before the video. 33 At noon, darkness came over the whole land until three in the afternoon. 34 And at three in the afternoon Jesus cried out in a loud voice, “Eloi, Eloi, lema sabachthani?” (which means “My God, my God, why have you forsaken me?”). 35 When some of those standing near heard this, they said, “Listen, he’s calling Elijah.” 36 Someone ran, filled a sponge with wine vinegar, put it on a staff, and offered it to Jesus to drink. “Now leave him alone. Let’s see if Elijah comes to take him down,” he said. 37 With a loud cry, Jesus breathed his last. 40 Some women were watching from a distance. Among them were Mary Magdalene, Mary the mother of James the younger and of Joseph, and Salome. 41 In Galilee these women had followed him and cared for his needs. Many other women who had come up with him to Jerusalem were also there. 42 It was Preparation Day (that is, the day before the Sabbath). So as evening approached,43 Joseph of Arimathea, a prominent member of the Council, who was himself waiting for the kingdom of God, went boldly to Pilate and asked for Jesus’ body. 44 Pilate was surprised to hear that he was already dead. Summoning the centurion, he asked him if Jesus had already died. 45 When he learned from the centurion that it was so, he gave the body to Joseph. 46 So Joseph bought some linen cloth, took down the body, wrapped it in the linen, and placed it in a tomb cut out of rock. Then he rolled a stone against the entrance of the tomb. 47 Mary Magdalene and Mary the mother of Joseph saw where he was laid. Tradition (and common sense) tell us that Mary was there for all of the horror. She was documented as being there when Jesus asked John to care for Mary as his own mother. She surely would not have left his side as He hung on the cross. And would have been there to help Joseph of Arimathea take the body down. 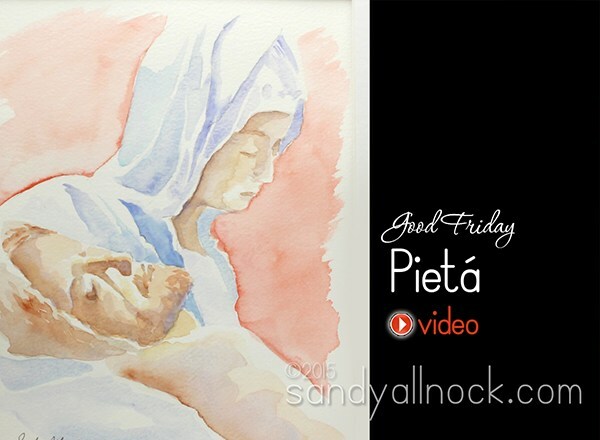 Artists have been moved to capture this moment, this “Pietá” – Mary holding the dead body of Christ at the foot of the cross – for centuries. As have I, today. Watch the video below, or click HERE to watch in HD on YouTube. Painting details: Kuretake Watercolors on Canson, Montval 140lb using a #6 Black Velvet Silver Brush. I used to wonder why this is called “Good” Friday, when it went seemingly tragically wrong that one day. But without this day…there would be no Easter. That makes it Good in my book. I saw this post in your list of online classes of water classes so I decided to click on it. Wow! All I could do was cry!! This really is profound and your talent is truly a gift from God. I hung my head in shame as I realized that though this year I did not make a blog post proclaiming my love and admiration for Christ, and what he did on the Cross for me, but it was because of this very same Cross experience, that Good Friday day, that covers me and gives me victory for all those days that I seem to overwhelmed to deal with another day, let alone make a blog post. It is because of Him always knowing and seeing the unseen, that I don’t need to worry, or feel terrible because I haven’t shared His love with others, whether through a blog post or a creative project of mine. That sometimes it is just okay to sit, and quietly wait in His presence, no self condemnation required, just feeling His peace and strength. Thank you sweetie for blessing my life today and reminding me once again of God’s faithfulness through His son Jesus. Love your work and love you. Aww thank you so very much! It takes a lot for me to post something like this too – and I’m beginning to schedule in a faith post to remind myself to proclaim His goodness on a regular basis. Otherwise…other things pop up on the list and take over. As a mother you have the privilege of holding that precious child as they enter the world. I can’t begin to imagine witnessing their death and cradling them in your arms as they leave this earth. I unabashedly sobbed as I watched you paint this. Your talent and depiction of the Pieta is stunning. Thank you for sharing! You are amazing and inspiring. Thank you for bringing Jesus into the craft world. I’m studying the book of Luke at the moment. My husband and I were commenting on how Mary was the first person on this Earth to be “all in” with Jesus and support His ministry. From the moment she was told she would have a Child, she surrendered to God her life and dreams. I can’t imagine the pain of that day. I remember watching “The Passion” a few years ago…actually, most of it I saw with my hands covering my eyes…but I remember crying when I saw Mary looking at her Son. As a mom of two boys, I just can’t imagine…. But He fulfilled His mission…and He’s coming back soon! May we all be ready! Stunning and moving to see your art and read your post…thank you! Happy Easter! Sandy this is beautiful! Art should move people, and this is a perfect example! Your selection of music is great. I commented once before on your music selection and have now decided to just play your videos while I work. In our hurried everyday lives we need Art! This video says many things to me and is a great sermon in itself! Thank you so much for sharing this with all your fans!!! Thank you for this, Sandy. Beautiful! Thank You, Father, for Your Son. Sandy, so beautiful and touching! Thank you for sharing. For God so loved the world that who so ever believes in Him shall not perish but have everlasting life. Marvelous! 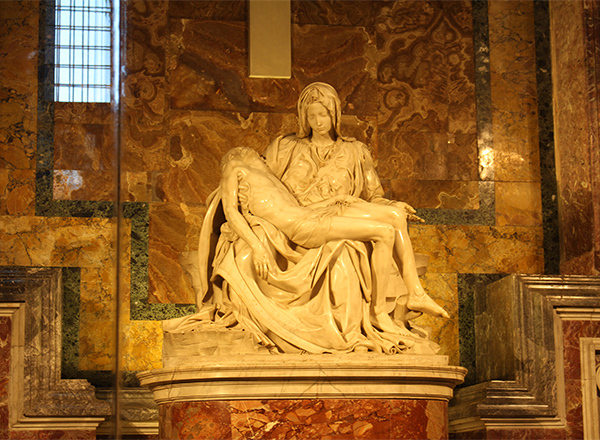 The Pieta is one of my favorite works of art, and is touching in ways that words cannot describe. I enjoyed your painting video. The work is simple, yet powerful. HE has touched you with a wonderful gift! Very moving Sandy! Thank you! Powerful, beautiful and worshipful on this Good Friday! Absolutely loved the video Sandy! That was amazing to watch! Thank you Sandy! As believers, we frequently gather to worship together through music, study and giving – but we don’t often get to worship corporately through art. By sharing this with all of us, I think you’ve given us that opportunity – and as an Art lover this touches me deeply. Thank you for sharing – thank you for being a worship leader. Sandy, this painting is one of your best! It is stunning, emotive and poignant. I waited to watch it as the video was part of my Good Friday reflection. You bless the world through sharing your talents. This brings it home, doesn’t it. Why this Holy Week culminating in Easter is so vital to the Christian faiths. Lovely depiction of this moment. Wow, what a beautiful painting! Like you, Sandy, I have often wondered how Mary was able to bear seeing her son being tortured and watching Him die. She knew of the unfathomable love behind the reason that He allowed it to happen, though. All that love to redeem you and me!! You do such beautiful work and deliver such lovely messages! Thank you for all that inspiration! God bless you this Easter and always! amazing art and amen to your words of wisdom! Beautiful. Thanks for the gentle reminder. I’m with you I used to wonder about the “good” Friday. Like you, it dawned on me one day – it’s a mighty GOOD day for me. Bad day for Jesus, but the BEST for me. Thank you, Jesus! Our God has gifted you with some serious talent, Sandy. 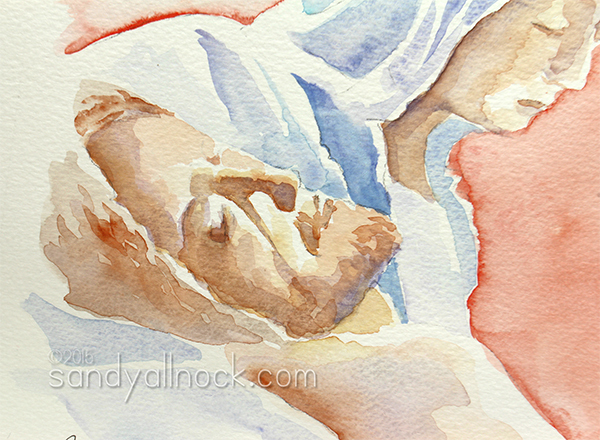 Thanks for sharing this beautiful watercolor and your faith. He is risen indeed! Thank you for sharing your experience with us. I cannot fathom the depth of Mary’s grief as she watched her savior and her son on the cross. Such a poignant sculpture and a beautiful water color interpretation. Happy Easter Sandy! Thank you. To God be the glory. A very beautiful beginning for a meaningful weekend. Thank you. I’ve already commented on the video but I wanted to comment here too. Never have I purposely “pinned” something multiple times, but I did this post/video onto several of my boards in hopes that more people will come and watch. Again, thank you for sharing it. Amen, what a treat to see this statue in Rome. I surely would have wept myself! Nicely done, Happiest Easter to you! Your water color Pieta is beautiful, Sandy. Thanks for sharing your thoughts and your art with us.